We are not sure that there is a “silly theme” amongst the video slot games but if there is, Wonky Wabbits casino slot game is a perfect example. You can win up to 390.000 coins in this “silly” NetEnt online slots game which features some crazy rabbits. The game has 2D graphics but they look very nice, in fact, with rabbits jumping around from all sides, it looks marvelous. The game has 5 reels, 15 pay lines and some innovative features. As for symbols, there are ten in total. Five of them are in the shape of fruits/vegetables and high-valued. The rest is low-valued and shown with numbers & letters. The carrot symbol is the most valued one with a payout of 1.500 coins. 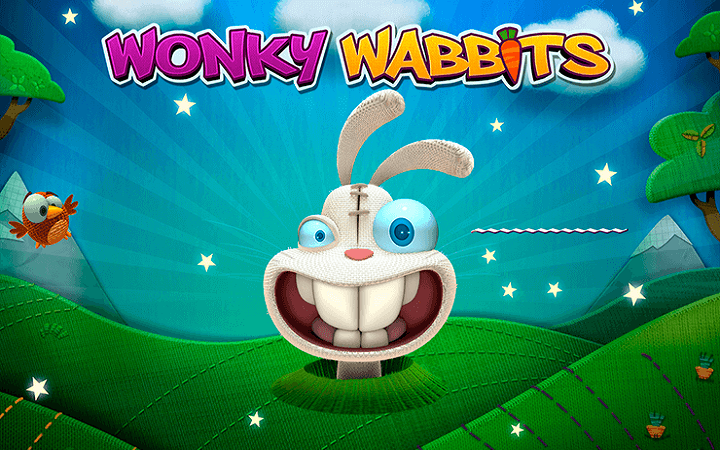 Wonky Wabbits online slot game by NetEnt uses the “win both ways” feature. In other words, winning combinations are not calculated only from left to right; right to left calculations are used too. As for the special symbols, the game contains only the wild symbol. That’s right – no scatter symbols, no free spins and even no multipliers. But the features of the wild symbol are many: first, it substitutes all other symbols and appears on all reels. On reels 2 and 4, it can become stacked and boost your winnings. It also has a special feature called “wild duplication”. This feature allows the duplication of the wild symbol to the position that creates the highest possible win. Let’s give a “real” example to get a better understanding: when wild duplication happens, a maximum of 14 wild symbols can appear on reels. Since there are only 20 slots, this is a huge advantage – almost %90 of the reels turns into wild and –of course- guarantees a winning. The coin value of the game changes between 0.01 and 0.50 coins, which makes the maximum bet amount a total of 150 coins. The special feature triggers more than often, so we can recommend this game to all players who love to play casino slots online. If you play at Casino Avenue, you can try the free slots no download version, which you can play completely for free.